Today we’re looking at the flagship of Aukey’s mechanical keyboard range, the KM-G4. 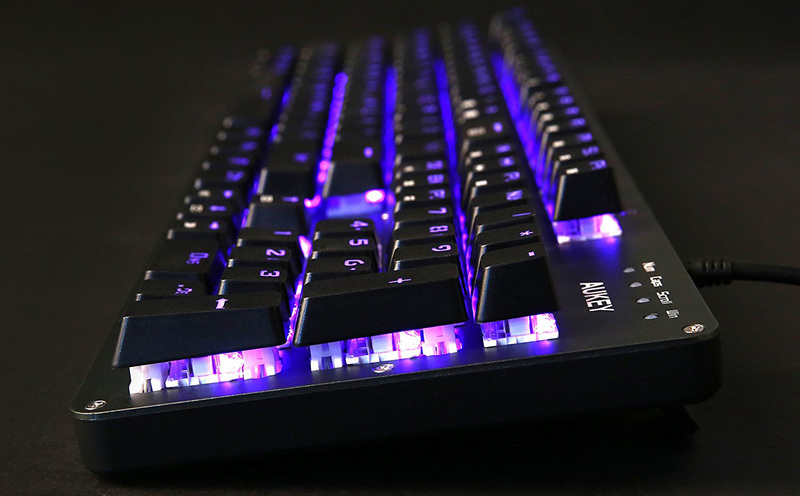 It comes with a full layout of mechanical switches and fancy RGB backlighting. 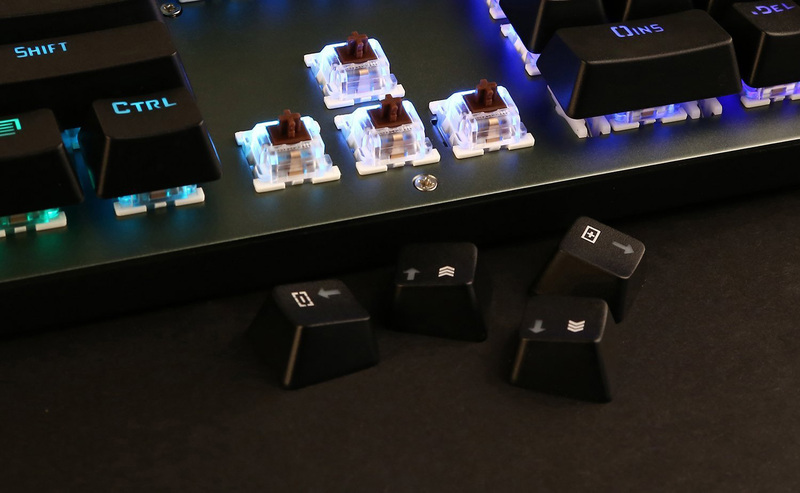 We’re looking at the model with Brown Cherry MX style switches, although these particular switches were made by Outemu. Let’s see what you get for your £56 or $65. 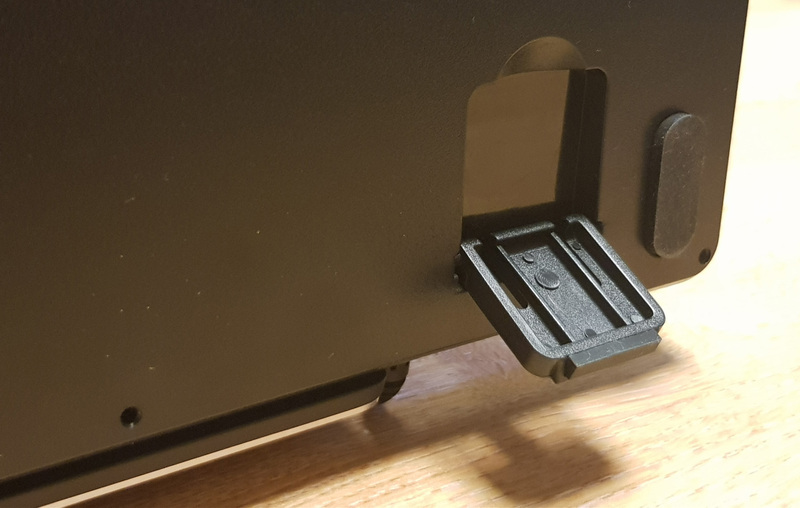 The G4 has a military or industrial-inspired design, with the keys floating atop a thin plate of green-ish aluminium with visible screw holes throughout. The keycaps are backlit ABS, a standard budget choice, with laser-etched legends that allow the LEDs below to shine through. The legends are in the standard ‘gamer-friendly’ stenciled font, but they’re not too disagreeable. 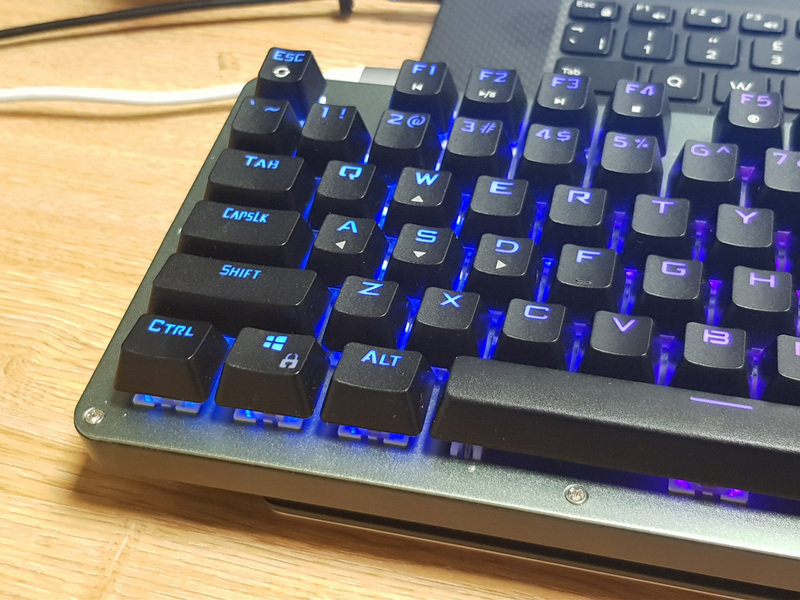 It’s worth noting that the keyboard is available only in a US / ANSI layout, so if you are used to a UK / ISO layout you will find a few keys are different sizes or have swapped places. However, this does mean finding replacement keycap sets is much easier, so it’s not a dealbreaker for me. The LEDs themselves are RGB, which means you can switch between multiple colours, and there are plenty of lighting modes as well. These modes and colours can be changed without needing to install any software using keys on the keyboard. You also get rapid access to media playback and volume controls. We used the G4 for a one week period at work, as well as at home for a few hours of gaming. We found that the keyboard worked well; the repeated or missed keys reported by some Amazon reviews didn’t appear to afflict our unit. The Outemu Brown switches worked just fine, providing good tactile response without being super loud or requiring much force to actuate. However, the ABS keycaps aren’t as pleasant as the PBT keycaps found on higher-grade keyboards (or in custom keycap replacement sets). The full size of the keyboard means you get full access to the numpad, which is handy for doing your taxes or maybe your job, but it also stretches out your arms uncomfortably — I prefer less wide tenkeyless layouts for this reason. The backlighting was strong and fun to mess around with, although we ultimately settled on a single static colour. Usually you only get a single button to switch linearly through a list of modes, so it was nice to have dedicated keys for each effect. In conclusion, the Aukey KM-G4 is a fairly average keyboard. It comes with a full layout, a good range of switches and it has some nice effects. The build quality is solid enough, and it has no game-breaking quirks. However, it doesn’t differentiate itself from its competitors in any meaningful way either — there are plenty of similar keyboards which offer the same range of features, including some at lower price points. If the price drops much below £40 / $45 it could be a winner, but as it stands Aukey’s mech isn’t worth springing for. Something like the Reidea RGB could be a better fit!